New Jewellery Necklace Set. Stunning silver plated set withstudded high quality stimulated CZ diamond stones. Full set includes Due to the difference between different monitors/screens and studio lighting the picture may not reflect the actual color of the item. Black and silver necklace. Ideal for indian wedding functions or party wear. New Indian Bollywood jewellery Necklace set Polki Gold Plated Designer set. 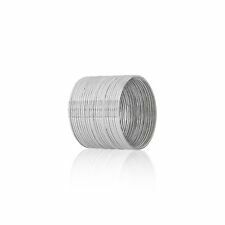 Indian Bollywood Metal Silver bangles set of 6. Dispatched with Royal Mail 2nd Class.It is available in 2.4 and 2.6. Stunning full set in silver tone. Indian wedding set. Due to the difference between different monitors/screens and studio lighting the picture may not reflect the actual color of the item. Jewellery Necklace Set In S ilver Plating In. White Crystal Stones with matching. in White Crystal Stones. Earrings & Matha Tikka. Woren only the once a beautifull set was made in pakistan. Comes with a knecklace that has white crystals and diamonds. Has a tikkah and pasa which also has crystals and diamonds. The earings have matching saharas nice and light. In very good condition. Purchased for £75 selling for £50. Gorgeous set by Twilight bridal. Silver plated, length 17" with 1.5" extender chain. It is very beautiful and elegant necklace with a matching earrings.you can't get such a beautiful necklace set in so much cheaper price. Feel free to ask any questions. And get one FREE! MIX N MATCH.Add any. VERY PRETTY AND EYE CATCHING. New Indian Bollywood Costume Jewellery Necklace Set Silver Design Wedding. Dispatched with Royal Mail 2nd Class. Indian Bollywood Jewellery Necklace Set. Stunning Polki gold plated set. Traditional royal antique complete set. Tikka (forehead piece). Full set includes Due to the difference between different monitors/screens and studio lighting the picture may not reflect the actual color of the item. Jewellery Necklace Set. Design Wedding Fashion. 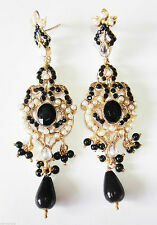 Designer EARRINGS FOR PIERCED EARS AND NECKLACE set. MIX N MATCH.Add any. and get one FREE! 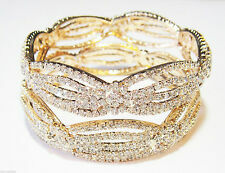 Can be worn for brides/functions. The Set is truly beautiful in real. The pictures do not do justice.